Does your company have at least one paid employee? If the answer is yes, then your business is required by law to display compliant versions of state and federal workplace posters in a conspicuous area visible and frequented by all employees. While many HR representatives and small business owners believe that once they have one poster up they’re all set and can forget about it, you must remember to monitor the labor and employment laws due to the ongoing changes that occur. Failure to do so can result in substantial fines. While the federal minimum wage did not change, the poster was updated with information regarding breaks for nursing mothers in the workplace. Additionally, information was added discussing the consequences of incorrectly classifying workers as independent contractors. The Department of Labor (DOL) updated the Employee Polygraph Protection Act (EPPA) to remove the penalty amount of up to $10,000 for not posting; and the poster now contains a broader statement that the secretary of labor can assess civil penalties against violators. The Federal Occupational Safety and Health Administration (OSHA) issued a new rule requiring employers to notify employees of their right to report work-related inquiries and illnesses free of retaliation. Employers may meet the posting obligation regarding this new rule by posting the latest version of the OSHA “It’s the Law” poster by November 1, 2016. You’ll want to make sure you have the following posters hanging in a conspicuous place frequented by all employees. This can include a break room, near a time clock or somewhere all employees can reasonably see it. Mandatory posting requirements can differ widely from state to state. The requirements are usually listed on state government websites. Mandatory federal posting requirements for covered employers are consistent. The following federally mandated posters and information should be clearly posted. A comprehensive list including these posters and others can be found on the DOL website. Sign up for an automated compliance plan. Many companies have year-long compliance programs that automatically ship out new posters with every update, so you can easily stay compliant. Periodically check the DOL and your state government sites to monitor any changes. 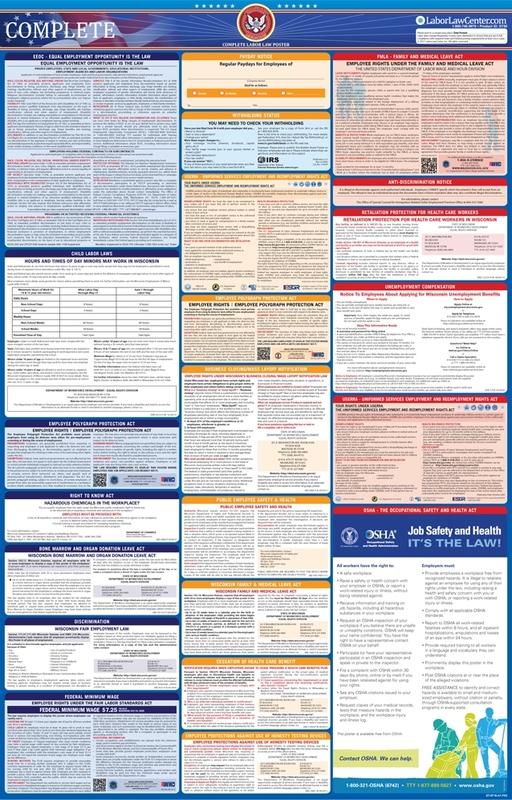 You can also check a site that provides comprehensive labor law poster updates. Editor’s note: TriNet clients stay updated year-round with compliance posters at no additional fee. Contact us for more information. Maintaining compliance can seem like a burden but it is important to make sure your posters are the most up-to-date versions to avoid hefty fines for non-compliance and avoid employee lawsuits. Anna Kim is the marketing coordinator at LaborLawCenter, a company that provides compliance products and posters to thousands of businesses nationwide.